Morocco is the perfect place to consider a beach holiday. Since Morocco is nestled between the Atlantic and Mediterranean coasts, you won’t have trouble finding a beautiful beach for your Morocco travel your vacation while taking in the local seafood fare. If you choose to relax by the tranquil Mediterranean shores, you are in store for unspoiled Moroccan beaches with dramatic scenery of rocky inlets and headlands. In comparison, the beaches by the 2000 mile turquoise lit Moroccan Atlantic shore are more popular as they are lined with pristine stretches of sand. 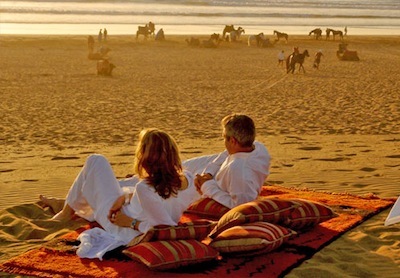 You will surely be astounded by the sand dunes, mythical cliffs and bluffs when traveling to the seaside of Morocco. Four of the most popular Atlantic resorts for Moroccan travel are Agadir, Essaouira, and Mirleft El Jadida, all have stunning sandy beaches with a plethora of exciting things to see and do. Moulay Bousalam, a smaller beach with rolling sand dunes that resides within a fishing town on the Atlantic is a less touristic alternative then Agadir and Essouaira and is where many Moroccans from Fes travel for their vacations and own second homes. Argued to be one of the most beautiful seaside resorts to travel to in Morocco, a visit to Agadir is a memorable experience as it offers a glimpse of the Modern Maghreb. Agadir’s beach boasts a sparkling unpolluted crescent shaped shore that has retained a mountainous Kasbah backdrop even with the new seaside buildings that have sprung up in the past several years. The city is located on the shore of the Atlantic Ocean near the foot of the Atlas Mountains, just north of the point where the Souss River flows into the ocean. Agadir is an important fishing and commercial port, the first sardine port in the world, (exporting cobalt, manganese, zinc and citrus). Because of its large buildings, wide roads, modern touristic hotels, and European-style cafes, Agadir is not a typical city of traditional Morocco, but it is a modern, busy and dynamic town. Agadir is famous for its seafood and agriculture. Even though Agadir’s popularity continues to grow, it is possible to escape the crowds during Morocco’s travel peak season (June – July) by visiting any one of the nearby beaches. Taghazout is only 19 km north of Agadir and a favorite of surfers. After a few hours in the sun, there are several places to explore in Agadir that make for the perfect Morocco Beach Holiday. Maturer audiences have the option of renting horses, camels, or quad bikes to ride up the sand dunes. There are also numerous cafes with views of the sea that are wonderful to relax or people watch early in the morning or at sunset. Agadir is mellow and with its mix of new hotels, restaurants, shops and nights clubs it is an accessible place to travel to in Morocco for a vacation for singles, couples and families. Agadir also lays claim to one of the largest Marjane’s (the Moroccan equivalent of Target) in the country. Essaouira, formerly known as Mogador, is a city and tourist resort in western Morocco, on the Atlantic Coast. Archaelogical research shows that Essaouira has been occupied since prehistoric times. The bay at Essaouira is partially sheltered by the island of Mogador, making it a peaceful harbour protected against strong marine winds and perfect for a Morocco Beach Holiday. 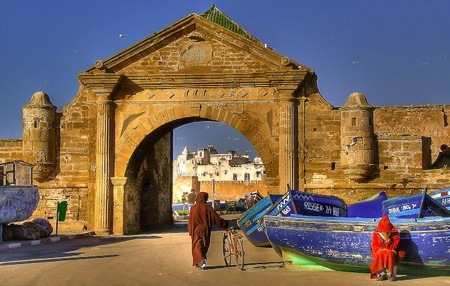 The Medina of Essaouira is a UNESCO World Heritage site and an example of a late 18th century fortified town. 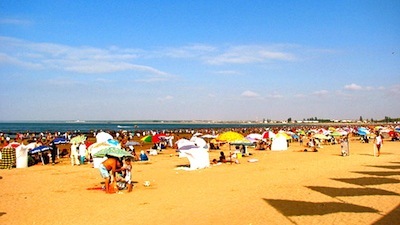 Essaouira remains one of the top seaside Moroccan travel destinations for foreigners. Referred to as the ‘windy city of Afrika’, the beaches of the 18th century French influenced Essaouria, are the most popular. The winds make it the ideal place to host windsurfing competitions and year round, you can spot people practicing the sport. Essaouria attracts diverse crowds because it offers a range of activities to do. When traveling to Essaouira, shop in the famous Thuya wood carving shops, take in the panoramic sights by Skala du Port, embrace the cafe scene, or visit the nearby islands. History and cultural lovers will also enjoy exploring the Mellah, where up to 9000 Jews lived between 1875-1900 exporting goods like salt and jewelry to London. You can also spend an afternoon climbing 15th century ramparts that were once sea bastions and fortifications. During the 19th century, Essaouira was the only part of port south of Tangier to trade with Europe. Tourism to Essaouira has been of growing importance over the past ten years, supporting boutique hotels established in traditional Moroccan riads, within the old town’s ramparts. The medina is home to many small arts and crafts businesses, notably cabinet making and ‘thuya’ wood carving (using roots of the Tetraclinis tree), both of which have been practiced in Essaouira for centuries. This beachside resort also has a fishing fleet and market. Essaouria offers a good range of cafes and restaurants near the ramparts with views of the sea. For lunch or dinner the best place to eat is at one of line of grills down at the port, an Essaouria institution, and cooking fish as fresh as can be. 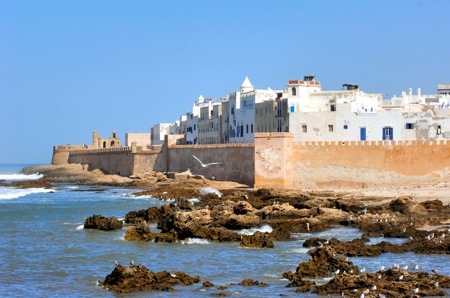 Essaouira is also renowned for its kitesurfing and windsurfing, with the powerful trade wind blowing almost constantly onto the protected, almost waveless, bay. 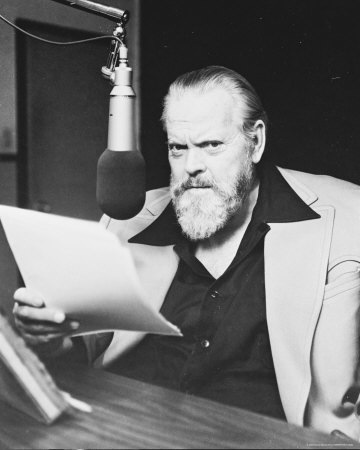 Several world-class clubs rent top-notch material on a weekly basis. Parasols tend to be used on the beach as a protection against the wind and the blowing sand. 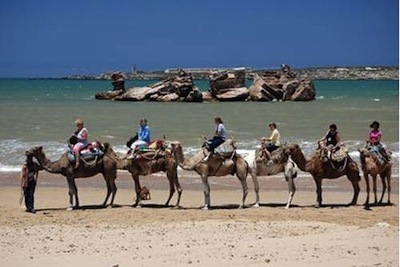 Camel excursions are available on the beach and into the desert band in the interior. Essaouria makes claim to one of Morocco’s largest and most successful annual events held each June, The Gnawa World Music Festival. Traveling to Essaouira during this festival season is one of the best ways to see Morocco The festival attracts approximately 600,000 attendees each summer and provides a platform for exchanges and a meeting point of music and dialogue between foreign artists and the mystical Gnawa musicians. In this melting-pot of musical fusion, the Gnawa masters invite players of jazz, pop, rock and contemporary World Music to explore new avenues. 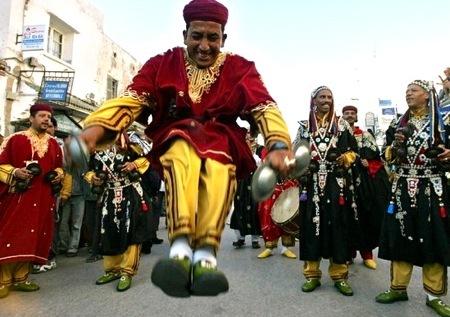 Past performers at the Gnawa World Music Festival include the French-Algerian group Gnawa Diffusion, the Rajistani Romany group Musafir, Vietnamese guitarist Nguyen, American drummer Sangoma Everett, Cuban pianist Omar Sosa, KyMani Marley, Wayne Shorter, the National Orchestra of Barbès Trio Joubran, the English genius of bluesman Justin Adams, as well as the incredible Toumani Diabaté and the Korean traditional percussions of the Salmunori Group. Mirleft is a fishing village South of Agadir between Tiznit and Sidi Ifni and perfect for a Morocco Beach Holiday. The village of Mirleft acquired a robust reputation in Morocco for the quality of its white sand beaches, its almost inaccessible creeks between cliffs and ocean, or its sand dunes shaped by the wind of the desert. The taste of the sun, the crash of the oceanic waves, the immense areas of sand the tourist fond of seaside pleasures. The bank of Mirleft is a part of these unique places these lost small places that the best surfers advise in secret. Often impressive and especially regular waves in a wild and grand decoration. The warm hospitality of the people in Mirleft and the beautiful weather make it an ideal Morocco vacation spot. If you want a lower key place to sunbathe when traveling to Morocco, yet still prefer to spend afternoons mingling with locals, Moulay Bousalam is the simple and charming choice for a Morocco Beach Holiday. The town’s beach is different from most along the Atlantic shores because it is surrounded by cliffs, sand dunes and impacted by waves that can sometimes be dangerous. Year round, some Moroccans can be spotted making a pilgrimage to visit the remains of 10th century Egyptian, who the town was named after. This sleepy fishing town attracts the most visitors in July and August. Another point of interest is Merdja Zerga, a lagoon used as a space for herding wild sheep, cattle, and goats. People also visit this quaint beach town throughout the year for bird watching. The region is well-known for the quality of its shad (cousin of the sardine) and of its seafood in general. Opposite the Bastion of the Angel, on the port of El Jadida, or along the boulevard de Suez, eating in any of the numerous restaurants will let you sample this while having an enjoyable time. If the premises are simple ones, their cooking is no less delicious. Here you will be able to sample grilled sea urchins, grilled sardines and other seafood, etc. Further to the south (76km), a visit to Oualidia is a must. This charming seaside resort is well known for its oysters. You can try them on the terrace of a restaurant or directly from the oyster beds in the lagoon where they are grown. You will also be able to hire a guide and a small boat. There is simply too much choice… The water is calm and perfect for swimming. The beach of the chic seaside resort of Sidi-Bouzid, 3km to the south, is magnificent and the current coming from the Canaries gives it a particular freshness. Haouzia is the name of Azemmour’s attractive beach to the north. The Royal Golf Club is worth the trip: its course weaves through the middle of a eucalyptus forest. You are currently browsing the archives for the Essaouria Morocco category.